On Monday, January 22, 2018, we discovered a fraudulent email, also known as "phishing," currently circulating the internet. It is disguised as a NASA Federal email and has been received by Credit Union members. This email is not from NASA Federal. The false email asks the recipient to click on a link to verify their Credit Union account information. The link then directs them to a fraudulent website resembling the eBranch online banking log in page and asks for their Credit Union account number, PIN, as well as other personal information. NASA Federal will never ask for account numbers, passwords, or personal information through email. As a general rule, if you are asked for account information via email, you should consider it to be a fraudulent attempt to obtain your personal account data and you should delete the email. 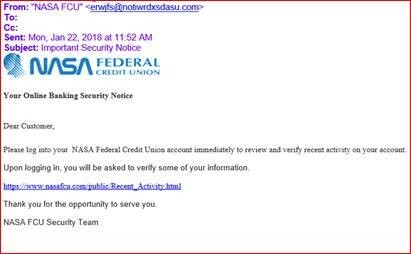 If you responded to such an email and provided any confidential account information, please notify us immediately at support@nasafcu.com or 1-888-NASA-FCU (627-2328). We will take immediate action to protect your account. NASA Federal Credit Union takes the security of your personal and account information seriously. If you want to know more about ways to keep your information safe, visit our webpage on online banking security.